The first time I twisted Benefit’s new Fakeup Crease-Control Hydrating Concealer, I came this close to swiping the stick across my lips. But can you blame me? Doesn’t it look an awful lot like one of those hybrid lipstick/glosses we’ve seen stalking makeup counters over the past couple years? The Fakeups, which arrive this March, borrow that same lycanthropic idea by combining two different things. Twist up the tube to reveal a stick with a creamy concealer center surrounded by a solid moisturizer containing vitamin E and apple extract. For a brighter under-eye area, less visible dark circles and a lightweight look, just swipe under your eyes, and blend with a finger. The hydrating formula (decently moisturizing, but I wouldn’t give up eye cream for it) steers clear of my fine lines, too, and I swear it looks like real skin. 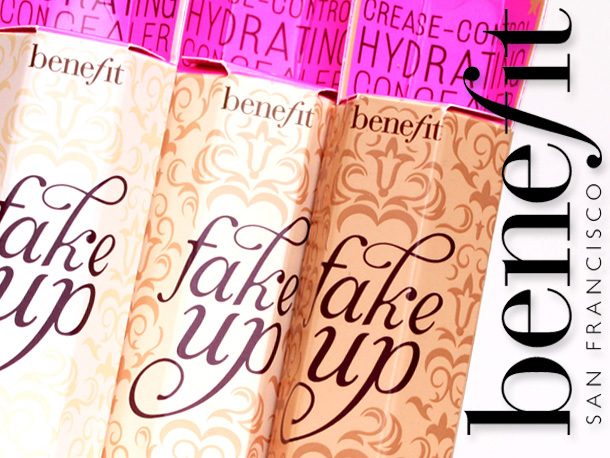 Benefit likes to streamline their products, many times releasing things in one or two shades. Sometimes, I think it really works. Keep things simple, right? Like with their famous Benetint Lip and Cheek Stain. 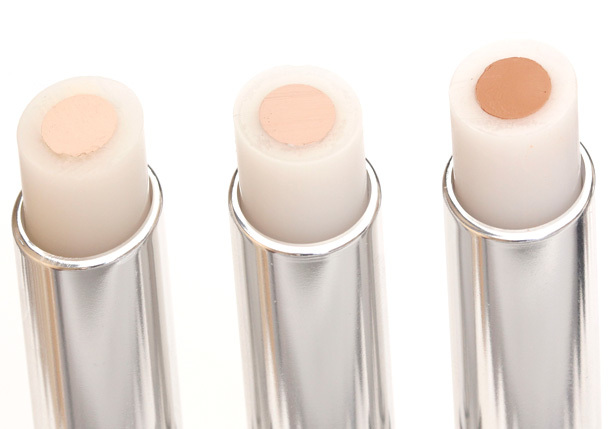 But for certain products, like concealers, a very limited color selection can be a turnoff, particularly for people with extremely light or dark skin. Guess what…? 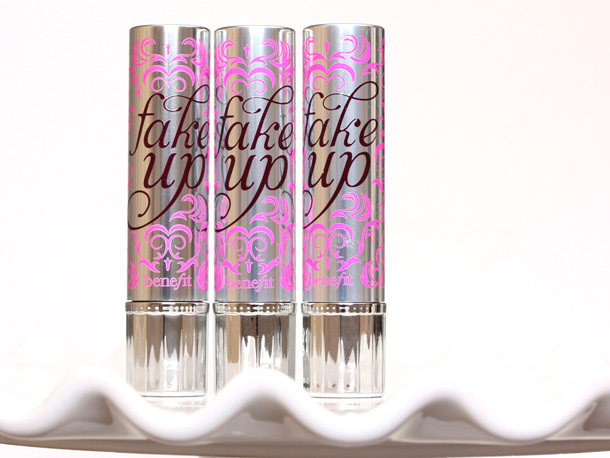 Fakeup only comes in three shades (Light, Medium and Dark). I fall somewhere between Medium and Dark, so I’ve been mixing the shades, swiping both of them beneath my eyes and blending them together with a finger. On the plus side, at least it works! 🙂 With Fakeup applied, I can barely see my dark circles at all or the actual product. Thanks to a satin finish and a lightweight formula that doesn’t settle into my fine lines, the finished look barely looks like anything at all! — which is exactly the right idea. It could use a little help in the wear time department, because unlike MAC Pro Longwear, which I can apply in the morning and ignore for 14 hours, I need a touchup when I’m wearing Fakeup after hours 4-5. Good thing it doesn’t cake when layering, and the stick travels well in my purse. Ugh, this is precisely why I can’t roll with Benefit anymore. I don’t appreciate their color range despite all the effort they put into their cutesy packaging. I appreciate that there are other brands out there that try to cater to a wider range of skin tones, especially those of us who are darker than medium. The only products I love from Benefit would be Coralista and Dallas (as recommended by Karen)… I like Eye Bright too… Gimmicky products like this one from this brand just turns me off.. 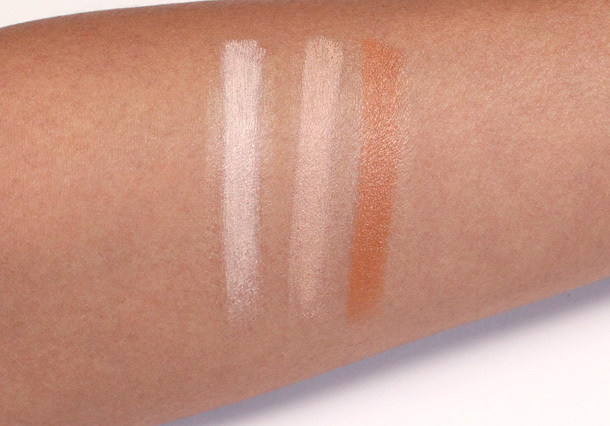 I think I’ll have to check it out on my skin to know for sure since there are only 3 shades. Their limited range of shades is precisely why I rarely bother with Benefit. what skin-shade are you? (mac?) these would be perfect if the colour works. could the medium fit for a mac nc35 shade?! 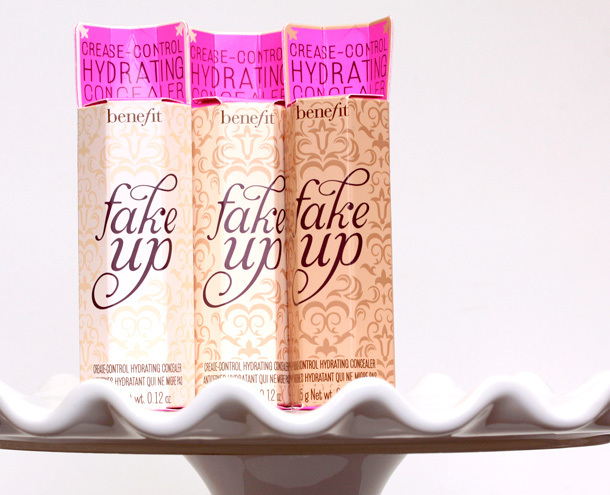 Benefit always seems to hit it out of the park when it comes to concealer. I know they don’t always offer the greatest range of colors, but I hear people go on and on about Boing and Erase Paste all the time. I can’t wait to try this one. Teri recently posted … Friday Finds: January 25, 2013. Based off your swatches, I think I’d be a medium. Which is good news for me, but it’s a shame they’re only offering 3 shades – I feel like they’re alienating a sizable client base because most people won’t bother custom blending their own shade. 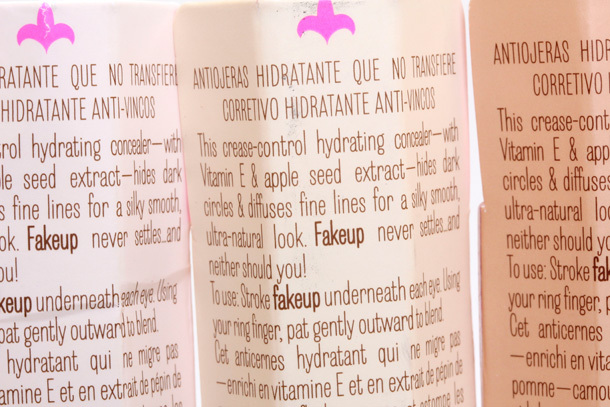 Maybe if this product does really well they’ll open up a wider shade range – maybe? I wish this product wore longer though. I agree with other commenters on the fact that there are only 3 shades. 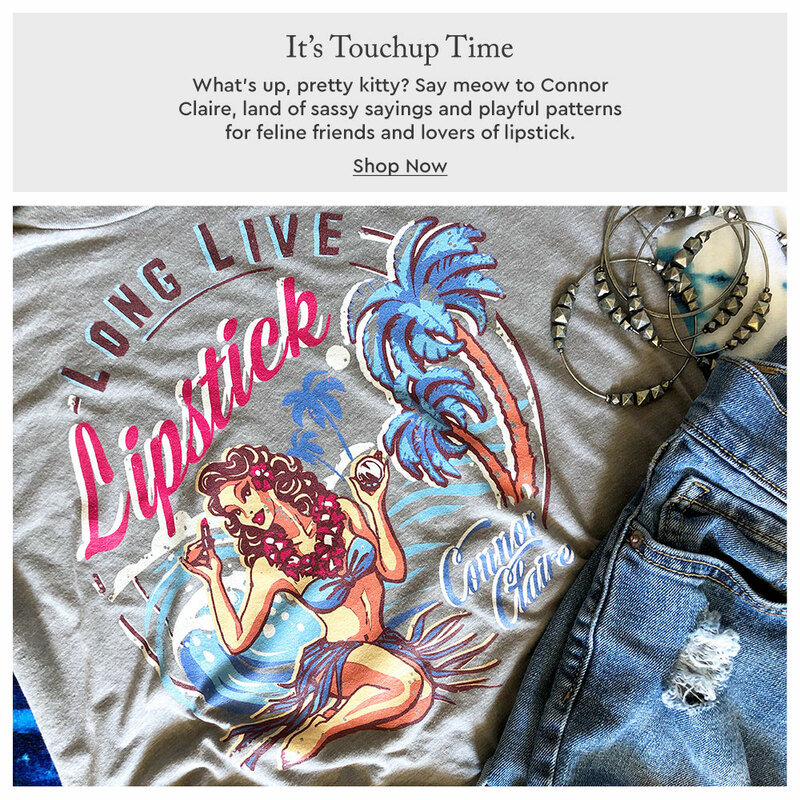 I don’t mind mixing and matching either at times but most of the time I want something I can swipe on and go out the door (Smashbox has a great stick concealer that comes in many shades that I used for years to cover zits). That said, this concealer looks like a good travel option if you can’t bring your eye cream because you are limited in quart-sized bag options. Maybe eventually they will come out with more shades…I am also curious about the wear time. I haven’t bought much from Benefit but your posts on their long wearing shadows makes me want to buy some of the neutrals I am seeing. oh wow, just 3 shades. not much of a choice. hahaha it’s an awesome concept and if it works i hope they expand the shade range. they have wonderful products. It’s a shame the color range is so narrow. 🙁 I will have to see in person if medium will work on me. I love BeneFit but I can’t hang with the limited shades for skin. I do love Boing but it’s a coincidence they had a shade for me at all. People do not come in light, medium, and dark! I’m veeerrrrry skeptical. The coverage is good?? GASP! A Benefit concealer that would ACTUALLY match my skin??? Shocking! Too bad it doesn’t suit darker-skinned beauties easily. Very disappointed for them and I don’t use concealer to begin with. This is a really interesting idea, props to Benefit for being innovative! I think I’ll stick with doing my undereye moisturizing & concealing separately, but I do think they have a very creative team! Becca @ The Beauty Sample recently posted … Jouer Bare Beauty Collection Giveaway!!! Ah, Benefit is so frustrating. I hear such rave reviews, but their products just don’t match my skin. Come on, Benefit. There are more than three skin colors. This looks amazing, but I highly doubt it’ll match my skin 🙁 even their lightest foundation (Hello Flawless in Ivory) is too dark for me. Any other fair-skinned ladies with the same problem? Yes, Iren! I came here to say the same thing. 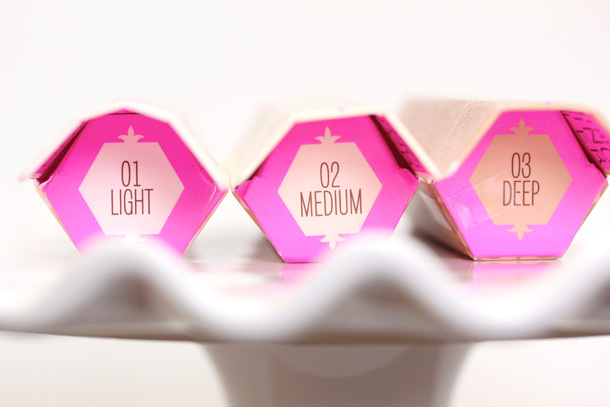 It seems like Benefit just sort of arbitrarily picks three shades they think are light, medium and dark, and the gals on either end of the spectrum get left out. I know most that are left out have darker skin tones, but I’m one of the few, like you, that need something lighter than what Benefit carries. It would be nice to see them expand their range, even if they added just one lighter and one darker to offer 5 options instead of 3, I bet they’d get an even bigger following! Yeah, I’m not sure I’d be willing to do all that when i can use Amazing Concealer and not have to mix and get the same results! hmmmm… these are interesting. I don’t think they would be enough coverage for me, I’m one of the few people who actually like Erase Paste. 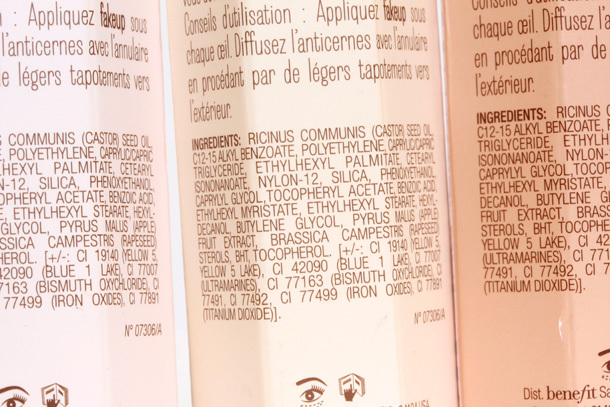 I agree with you on their shade range, I appreciate that they try to simplify things, but some products are simply not going to work for certain skin tones. Thanks for the review! How disappointing about the limited shades. I hate when makeup brands do this.